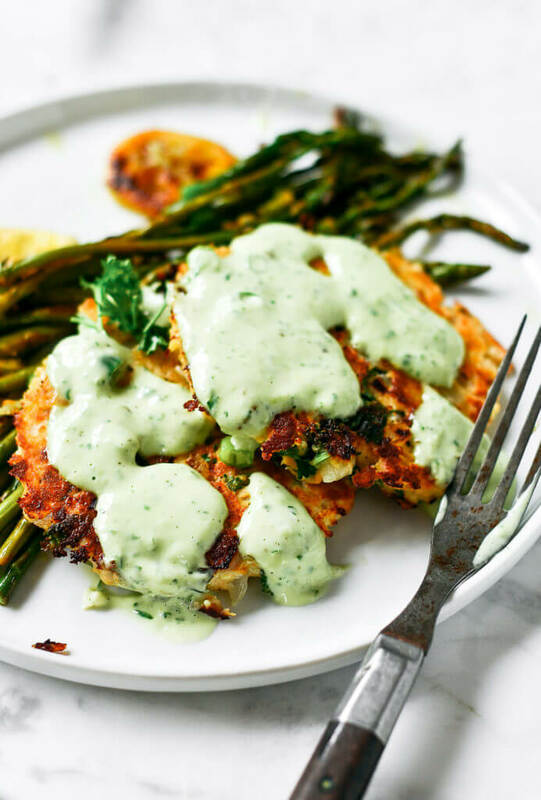 an appetite for zesty salmon burgers! Seeing as how our driveway is more akin to an ice-skating rink (no, for reals!! We actually went ice-skating on it!!!). I decided to wait out the freezing rainstorm with a little extra time in the kitchen and laps around the driveway with my skates. Failed attempts at pirouettes and axels on the bumpy driveway ice is a sure way to work up an appetite for some zesty salmon burgers! Lookie at all those beautiful greeeeens. Heart eyes. All. Day. Long. 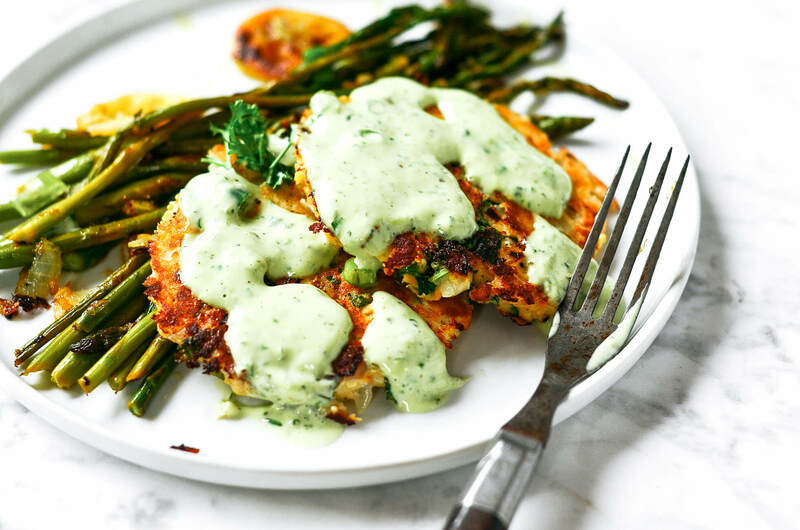 Those asparagus diving into a pool of cool and creamy tzatziki sauce has to be a highlight of my morning. Prepping this plate of scrumptiousness is way easier (and faster!) than one might assume. The salmon burgers are ready in no longer than eight minutes. 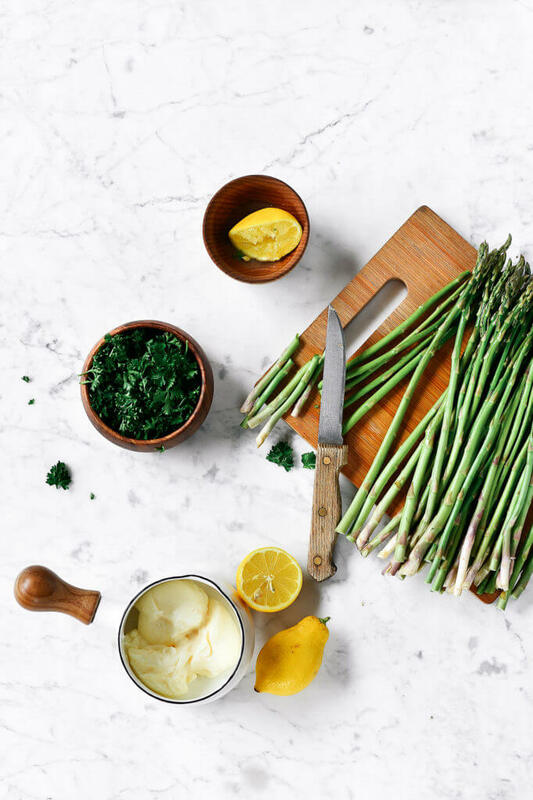 The asparagus is made in one pan and is low maintenance cooking for about fourteen minutes. And that sauce!! Oooooh, did I mention that sauce? Well, that beautiful magic green sauce is whipped up in the blender (or food processor). And there it is; one, two, and three! Boom. Dinner is served. I wish you guys could be in my kitchen right now and smell the aroma… It’s like a gallon of bright happy lemons mingling with cooking garlic and more earthy flavors. Two of the best things in the world. Garlic. And lemons. Now that I am back home and back to work, I am hoping I can start eating real meals. This 20 minute whole30 meal was a perfect place to start. Anyway, who’s ready to eat? Dinner will be served in 20 minutes! 🙂 Thanks for letting me join you in your kitchen today as I share my recent favorite! Enjoy! 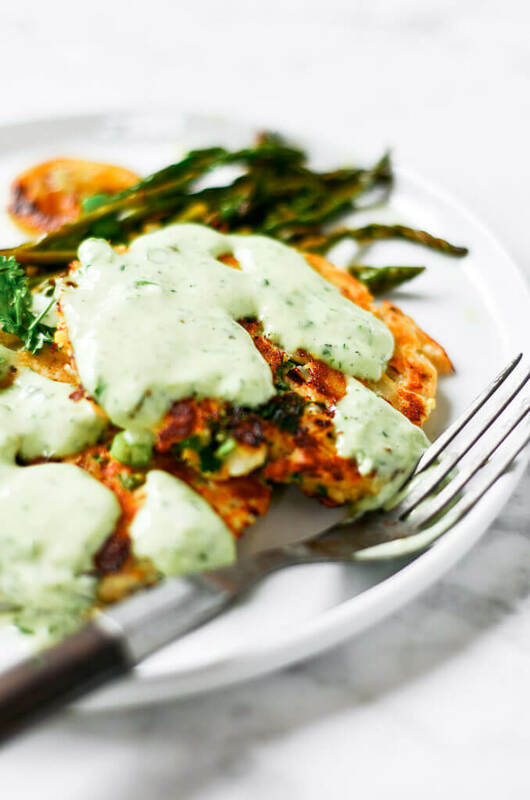 Zesty herb salmon burgers with lemon asparagus and tzatziki sauce! An easy and delicious whole30 meal that is ready in 20 minutes! Paleo, whole30, and a whole lot of fresh flavor. 1 6oz. can wild alaskan salmon or fresh salmon, which would be bomb! Combine all the ingredients for the salmon burger in a medium size bowl. Mash everything together with a large fork. Heat a large fry pan over medium heat on the stove. Drizzle the pan with 1 tablespoon olive oil. Separate the salmon burger mix into four burgers on the fry pan and cook for about 3 minutes on each side until golden brown. On the stove, heat a large fry pan on medium heat. Add everything for the asparagus and cook for about 14 minutes (stirring occasionally). Combine everything for the sauce in a blender or food processor. Blend until smooth. Perfect combination. Making tonight. Must admit to futzing around with your sauce recipe, however … had some anchovy fillets in the fridge, popped them in and Oh. Wow. Very much like a traditional Green Goddess dressing. You don’t taste the anchovy, but you know something magical is in there. Love this Lizzie! So glad it worked out! I don’t know if this is a polite thing to do because this is your recipe and it took a lot of time to come up and experimenting to come up with a recipe. I just am curious. Would or could you recommend a different kind of fish? My husband and I are not too fond of Salmon and really want to try your recipe. May I ask if you could recommend another kind of fish? Hey Emily! It’s one 6 oz. can of salmon. Yes- that does look confusing! I had the same question! 6 oz doesn’t seem like enough for 4 burgers though… ?? can (think of a can of tuna), which is, at least for me, enough for one patty (unless making tiny tiny patties). Secondly, the consistency of the burger mix was watery when I made it per the instructions. I ended up squeezing lots of juice out of the patties just to get them to a consistency where they weren’t falling apart in the frying pan. I used 12oz of salmon (one for me and one for my girlfriend), and it was just enough for two small “burgers”. I had a hard time keeping it together in the frying pan, and it ended up being more like a tuna salad type consistency than a burger. Maybe I did something wrong? I dunno, but I can say for sure that a 6oz can is not much food for two people (or even one person for that matter). At any rate, I appreciate the author sharing the recipe (especially the sauce). I’ll be eating the sauce for years to come :-). The sauce was great, reallly loved it. The patties were way too wet for me to keep together though. I still put one patty in the pan and once it was crispy on both sides it pretty much stayed together. I ended up mixing in almond flour to the remaining mix to soak up the rest of the liquid in the patty mixture and that solves the problem. Much easier to handle. My husband did not care for this (unfortunately). I enjoyed it but would probably go lighter on the lemon next time to reduce the juices and maybe switch up the protein. Thank you for this delicious recipe. I made it last night for my family and close friends. They loved it! I used fresh salmon, because I had some extra time – WOW! I didn’t have arrowroot flour so I used brown rice flour and found it worked great as a substitute. The sauce is awesome. I’m so happy I have a few left over for lunches today:) This will definitely be on my dinner rotation for a while. So good to hear Kim! I’m a bit confused, too. One 6 oz. can of salmon would meant that you are using 1.5 oz. of salmon per burger. I do notice that your patties look quite thin. My mixture is far too watery (that’s a lot of lemon juice) and falling apart to get them that thin. I popped them in the oven to see if I can get them to firm up in there, but it’s not working. May I also suggest that you note the number of people the recipe is supposed to serve – I assumed “4 burgers” meant that it served 4. I added about 1/4 cup pumpkin seeds, grilled and diced shitake mushrooms and red onions (grilled in ghee butter), fresh cilantro, fresh basil and fresh dill chopped up , 1/4 cup of paleo mayo, garlic powder and i used 4 cans of salmon and a dash of crushed red pepper flakes. They were so yummy!!! How do i follow you? This recipe looks great! 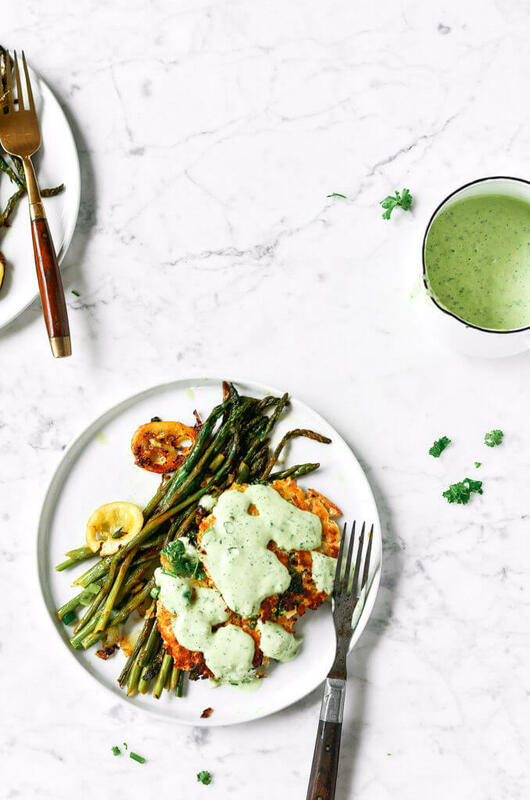 Love this recipe and I’m excited to make it as I start the whole30 Tuesday! Quick question: do you think that the salmon burgers would keep in the refrigerator for a few days (uncooked)? Thanks for sharing! This dish was absolutely incredible! Packed with flavor! I love to try new recipes, but usually only make them once because of the fact that I have so many new recipes to try on my Pinterest board. I make a new recipe almost every night. However, this one was so amazing that I am making it for the third time tonight 🙂 thanks for coming up with such a creative, delicious dish! 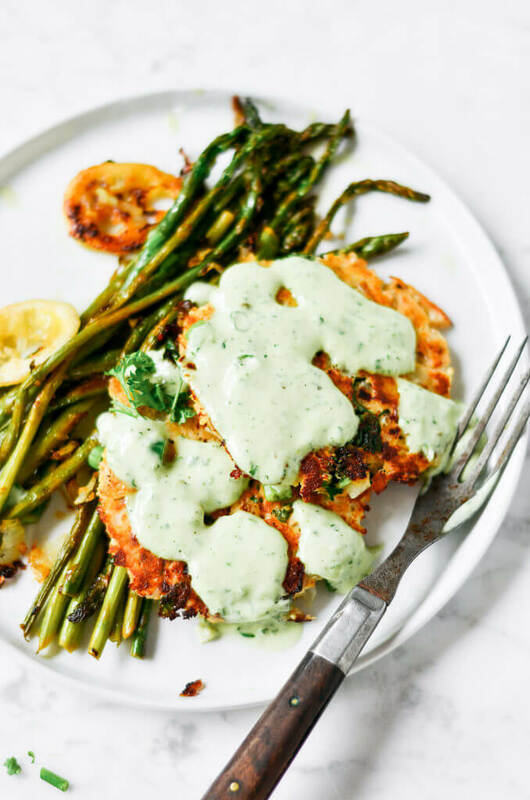 Making these today but wondered about the sauce – sounds like a lot and am curious to using leftovers with a salad for the next day. Thoughts? made these tonight. sooooo delicious!!!! One word. Amazing!!! Got two fist bumps from the hubs! Thank you for sharing! I just made this for dinner…OMG! So much flavor all around. I can’t wait to eat these again. Thank you so much for your yummy creation! Hi, I’m still new to this way of cooking, so I wondered if almond flour would be an ok substitute for arrowroot flour. I’m have a big bag of the almond flour, and am just trying to save money where I can. Thanks! This turned out to be a quick and very tasty meal! I had the same problem with the wetness of the mix. I added some additional arrowroot and let the mixture stand for a few minutes. It did tighten up. Added a couple pinches of almond flour for good measure. When I fried them I let it get really brown on the one side before turning and they held up ok, The mix made three decent size patties, which would be 2 oz of salmon per pattie. I like to serve at least 4 oz of protein per serving, so when I make this next time I’ll double the recipe and serve two patties per serving. The sauce is excellent and good for a lot of purposes. I I just discovered this recipe and look forward to making it. I saw several comments re patties falling apart. I’ve had same issue in past with salmon patties and solved the problem by putting them in freezer for an hour or so prior to cooking. What is a serving size? Is it 373 calories for one burger or for four? Are these 373 calories for one burger?